Sunshine and water can be the best cures for any problem. However, beach packing can bring a challenge. That’s where dedicated beach bags come in handy. You don’t know just how essential a proper beach bag is until you’re on the sand without one. You need space for items ranging from towels to toys to sips and snacks, and you don’t want to risk getting your favorite everyday bag covered in sand and saltwater. We’ve gathered a variety of beach bags, from family-friendly to built-in coolers, that are sure to do the trick for your best beach trip. Going to the beach worry-free is something to look forward to whether you're going for a day or a week. If you want a beach bag that can truly do it all, Dezzio has you covered. This beach bag brand, which originally produced their bags thanks to a successful crowd funding campaign, makes stylish bags filled with much appreciated details sure to make your beach day a breeze. The roomy, water-repellent bag holds all the essentials and features extras like a cooler pocket, a towel holder, a sunglass case, and even a bottle opener and USB ports. It’s like the beach bag equivalent of a Swiss army knife, and on top of all that, the bright aqua fabric is pretty fun too. Sometimes you just want a simple tote for your beach day. This tote from cool girl favorite Reformation is big enough to stash all your beach essentials, and we love the cute all-over retro comic book print. The eye-catching print brings some fabulous pop art style to the shore—you’ll be sure to get some compliments from your fellow beachgoers. And this bag has more going for it than just fun style. The heavyweight organic cotton is sure to hold up, and bonus, the busy print hides stains. If you’re bringing the whole family to the beach, your beach bag just got a lot heavier. Beach toys, sunscreen, and extra snacks can really add up, and you’re going to need something that can hold it all. This roomy mesh number gets the job done. The bag comes with a detachable shoulder strap for easy carrying and has enough pockets to fit everything your kids could possibly want to bring. The mesh fabric and removable bottom makes cleaning a no brainer—just rinse it with a hose or under the outdoor shower. The material is quick drying and pleasantly sporty. 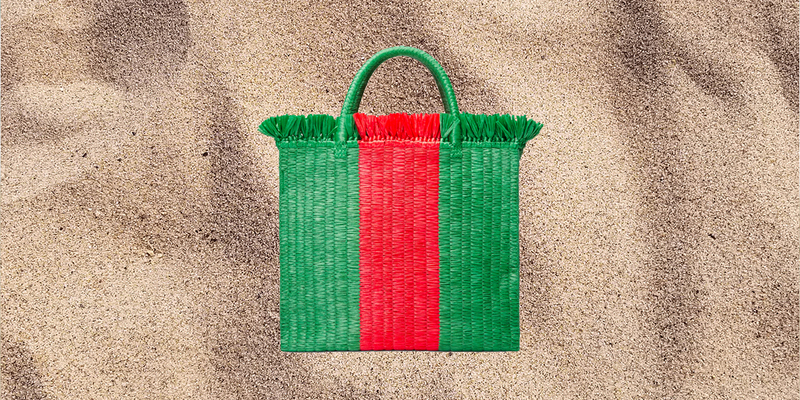 Okay, we realize that this Gucci beach bag is pretty extra. But in a world where flimsy straw beach bags that won’t stand up to seaside conditions are a dime a dozen, why not indulge and go for this eye-catching straw beach bag built for the ages? The hand-woven bag with a playful trim has a classic boxy shape and a clever play on Gucci’s signature red and green stripe. It works for both the beach and dinner and drinks after a day in the sun; the removable drawstring pouch keeps you organized. This will be the last beach bag you ever buy. This beach tote, covered in a lovely abstract blue print, wins rave reviews for being both waterproof and aesthetically pleasing. The heavy ripstop canvas material keeps water out and there’s a zippered interior pocket to further protect valuables. Exterior pockets are the perfect spot to stash sunglasses and sunscreen within easy reach. Soft rope handles give nautical charm and are just the right length to make carrying it a cinch. Take this bag to the shore and you can relax and enjoy splashing around without having to worry about a rogue wave splashing your stuff. 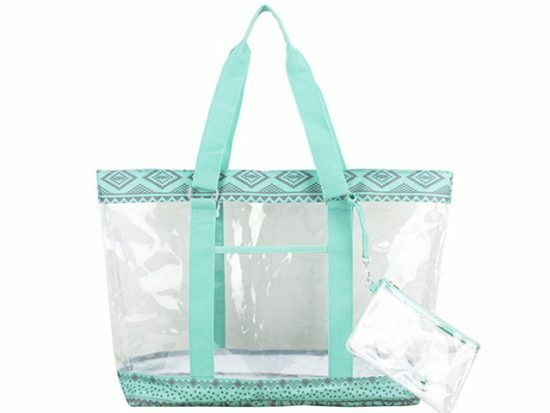 This turquoise mesh tote is a top pick on Amazon for a reason. 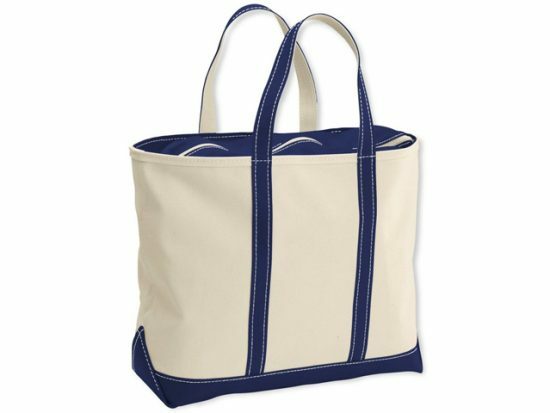 Think of it as a classic beach bag with a playful and convenient twist: It fits four large beach towels and features an insulated cooler bag section at the bottom. That’s right, there’s no need to worry about bringing a cooler or suffering with lukewarm drinks when you’ve got this well-designed bag. It even comes with a bonus waterproof cell phone case, so you can take your phone and cash for a swim, instead of leaving them unattended on the sand. Long handles with padding make for easy transport and it zips at the top to keep everything secure. 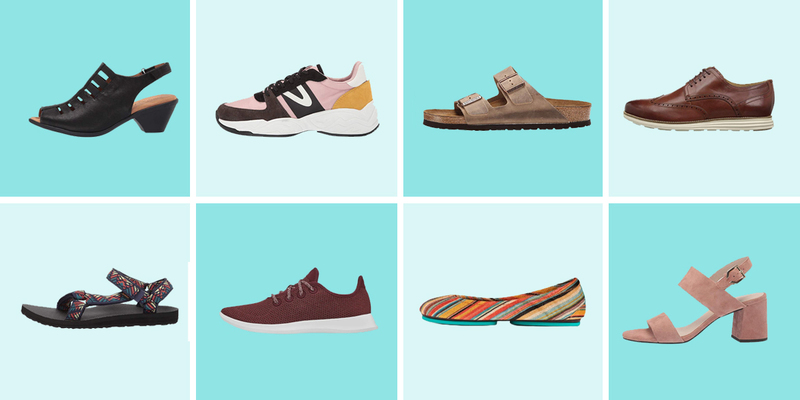 Want to be able to see all your beach essentials at a quick glance? Then a clear beach bag is the one for you. This PVC tote zips at the top and features an outer pocket, as well as a wristlet wallet you can clip to it or use on its own. The bag comes in six different colors and patterns. We like the light blue trim with the Aztec border. Clear bags are having a fashion moment and this one will both hold everything you need and look stylish. The L.L. Bean Boat and Tote is a preppy icon for a reason. Since 1944, these impressively durable totes have been handcrafted from heavy-duty canvas in Maine. They can hold up to 500 pounds, so unless you’re trying to set a record for heaviest beach bag ever, you’ll be totally secure in your packing. The bag comes in sizes from small to extra-large, with a choice of regular or long straps and a variety of colors from which to choose. You can even get this beach bag monogrammed. If you want a beach tote that’s both polished and rugged, this bag should be at the top of your list. This beach bag from pattern queen Vera Bradley features a charming coral or posie print. Designed for families, the spacious tote has a mesh top that both keeps your supplies secure and allows you to easily shake out sand. Parents will be pleased to see how this bag holds multiple towels and then some, and the drawstring top makes for a novel easy access alternative to a zipper. 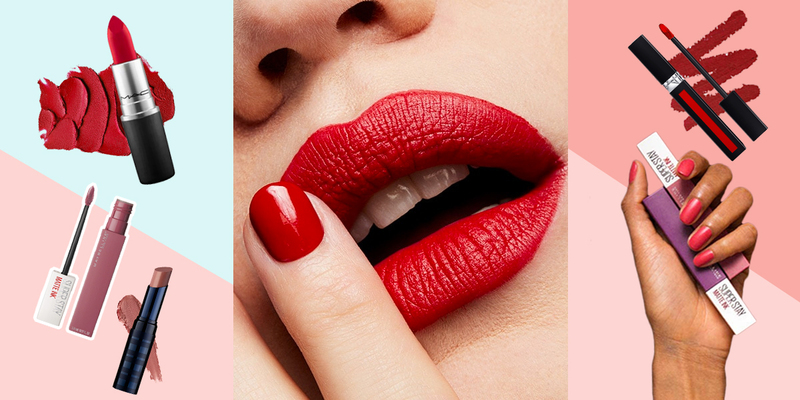 Still need convincing? 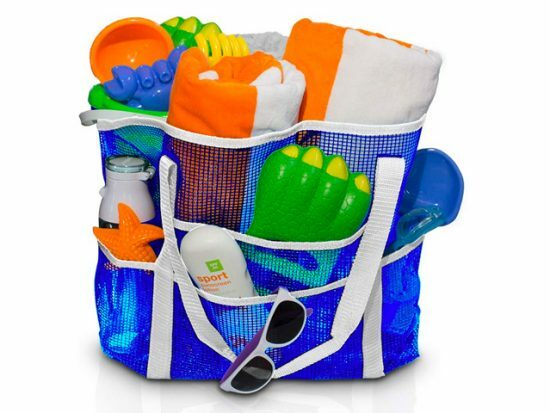 Just check out the reviews, which are filled with ringing endorsements from busy moms calling this an ideal beach bag. A little bit of gentle glycerin face soap, like Neutrogena, diluted in warm water, can be used to spot clean fabric beach bags. If your beach bag is made of heavy canvas, toss it in the washing machine. Make sure to wash it on a cold water cycle, and let it air dry. Hitting the beach a lot? Put a hook by your door or in the garage and use it to hang your beach bag for easy access. In the off-season, keep your beach bag in a clear storage box in your closet. You can also keep some of your other beach essentials in there, so everything’s in one place. Got a beach bag littered with sand and crumbs? Try vacuuming it to get rid of those pesky messes.